The Speer Gold Dot is among the finest hollow points in the market today, which is maybe surprising to some considering its first delivery to the market was in 1995. Others wouldn’t be surprised though, considering that Speer has been a market leader in the personal defense and law enforcement segments of the market for decades. 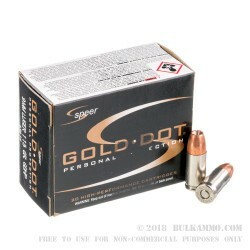 Their bonded bullet technology in the Speer Gold Dot has been a standard, with little changes over the past 20+ years, and has been a perennial performer. It should come as no surprise then, that they are still in the top spots for the defensive ammunition performance. Speer hold extensive law enforcement contracts, and year to year is almost always the top holder of contracts by value and volume. 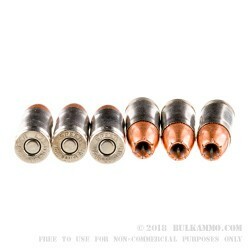 They were also the first company to offer a fully bonded jacketed hollow point design to the market, incidentally in this caliber in this line of products – the Gold Dot. Their commitment to personal defense performance is evident in their continual development of value adds to the product portfolio and their extensive coverage of law enforcement contracts, which contribute heavily to research and development. This is a 115 grain projectile inside of a nickel plated brass casing with a boxer primer - it is reloadable. 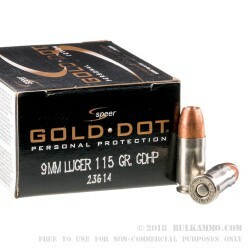 Q: Is speer gold dot's ammo a good option for self defense? A: Speer's Gold Dot ammunition is a great self-defense load. Gold Dot is especially designed to achieve deep penetration. The bullets loaded into Gold Dot ammunition undergo a bonding process which bonds the copper jacket at a molecular level to the lead core. This eliminates core/jacket separation and is the reason that so many police departments use Gold Dot ammo as their duty round. The bonded bullet is great for achieving deep penetration. 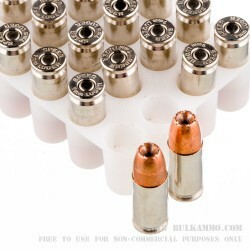 Gold Dot ammo performs great in the FBI test protocols achieving the desired 12-18" of penetration through various barriers such as glass at a compound angle, heavy clothing, etc. If using for home-defense you need to evaluate your particular home's layout and your concern for penetrating through Sheetrock. If this is a concern a cartridge such as Federal's Guard Dog would be better for this application as it is designed not to go through so many layers of Sheetrock while still achieving great expansion to stop a threat.